Your DSLR’s are the best of the best when it comes to handheld photography and video with chunky bodies and numerous available compatible lenses and accessories to choose from for any occasion or type of shooting. Needless to say, DSLR’s come with a bit of a price tag with lenses often costing more than the camera body itself. We’ve complied three of our favorite DSLR’s, an entry level DSLR, intermediate DSLR and professional standard DSLR to allow you to avoid getting ripped off and get the best deal on your camera of choice. The first of our DSLR’s, perfect for entry level photography, is the Canon EOS 1300D DSLR complete with EF-S18-55 DC III F3.5-5.6 Lens. Available in black, the 18 Megapixel camera comes with a APS-C CMOS sensor and DIGIC 4+ for speedy processing power. A 9-Point autofocus with both center cross autofocus and point autofocus available, finding focus should never be an issue again. Standard ISO 100 to 6400 is available with the option of expansion upto 12800, reducing the need for a flash. Lenses can easily be swapped with a wide range of EOS interchangeable lens available from Canon proving adaptable photography options. Wi-Fi is also available with remote control snapping from your smartphone as well as immediate back-ups and reviews from your handhelds. Full resolution shooting a 3fps means a decisive moment is never missed and the 920 K dot resolution 3 inch LCD screen means it’s easy to review snaps to get that perfect pic. 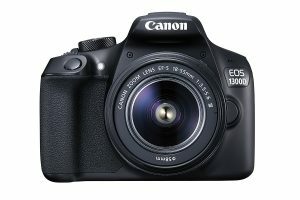 All in all, for the money, the Canon EOS 1300D is a fantastic entry level snapped, perfect for beginning your DSLR journey. 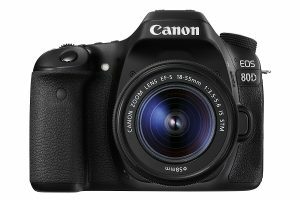 Stepping up the cost to a little under the £900 mark is the Canon 80D DSLR camera complete with 18-55mm STM lens. Another item from the photography giant Canon, the 80D is one of the best intermediate snappers on the market with a capable body and responsive 45-point cross-type autofocus system and 7 fps continuous shooting rate meaning you’ll never miss a split second snap. Atmospheric detailed 24.2 megapixel images are easily taken allowing for accurate exposure metering with a huge ISO availability of 100-16,000 with flicker detection, allowing shots in low light with minimal flash necessity. An intelligent viewfinder permits 100% coverage with a large vari-angle LCD touch screen making it so much easier to creatively control shots and view your image from awkward angles and locations. Professional movies and video and easily captured with full HD 60p availability and powerful Dual Pixel CMOS AF with full control for the user. Wi-Fi capability is once again available meaning smartphone connectability to capture photo/video, helping you maximise ease of use with the technology available. We appreciate that not everybody at an intermediate level will be able to dish out nearly £900 for a camera and single lens, but for the money you get a lot of camera and for one of the most expensive hobbies on the planet, it’s not bad going. If you’re looking for an intermediate camera, there’s not much else that could top the pile. 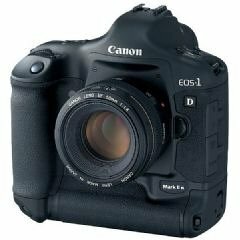 Pulling out the big boy, the Canon 1D Mark II DSLR is one of the greatest DSLR’s available and for the whopping £4600 price tag, it’s what you would expect. A tough and durable camera with a likening to a lump of iron, the body is enough to show how serious of a photographer you are. The 1D Mark II features an 8.2MP CMOS sensor and 8.5 fps or 48 JPEG image burst allows more photographs a second that you can comprehend with full resolution, meaning you’ll never miss a photo opportunity. A 45-point autofocus means shots will always be in focus, all of which can be reviewed on the 2.5inch screen. Processing power is looked after with the DIGIC II and a wide ISO range from L:50 to H:3200 means flash is optional in the lowest of light. All in all, the Canon 1D is not a camera to be messed around with and has to be seen to be appreciated. If you can afford the body, there’s no reason not to get it, although we would not recommend unless you’re serious about the art.